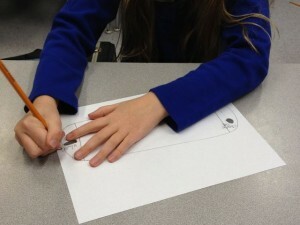 I've started a Media and Design Club for students at my children's school. It's an idea that started out of a desire to get the kids involved with the creation of the school yearbook, which has previously been done by parent volunteers who are more time-constrained this year than usual. Rather than just doing a "Yearbook Club" though, I wanted to aim a little broader. We have a lot of time before the school yearbook needs to be completed (I am starting the club the first week in January that we're back in school.) I also have this not-too-secret goal to help kids understand what careers in technology look like beyond just the stereotype of the geek (male) programmer. So the idea with the Media and Design club is that we will talk about various elements of media - audio, video, writing, as well as design. Why are things designed the way they are? Why do things in the world or online work the way they do? This is the first in a series of writeups of our Media and Design Club meetings. I encourage you to steal these ideas wholesale (like Austin Kleon recommends in his blog post Steal Like an Artist) for your own Media and Design Club (which, for the record, we're calling the MAD club, which amuses me to no end.) Any questions? Hit me up by email or write in the comments. 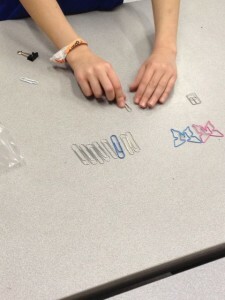 Activity Question: How do we sort and categorize information? The idea is to give the kids a group of objects that are *hard* to categorize. Where there are tricky calls to make. Does the large white plastic paper clip go with large paperclips or the colorful ones? Does the coin from Ireland go with the coin from England or with other silver ones? Assignment: Take these objects and organize them however you like. In 3 minutes (it took more like 2) be prepared to talk about your organization choices and how you decided to organize things the way you did. Activity Objective: Understand there are many ways to categorize things. Many different "indexing keys." After this activity, we talked about the many ways we could organize a big batch of photos taken over the course of the school year - by date, by event, by who is in them, by class. Discussion: For the Yearbook, we are going to need to sort and organize photographs into some way that lets us easily find images we want. How should we organize them? What are some ways we could organize the photos? - Grades - class pictures, etc. How do the decisions we make about organizing things change when the objects are virtual like digital pictures? Activity Question: What would be useful to know about this object? What is it made of/what materials were used to create it? Does it have any symbolic significance? Activity Objective: Understand the role of "metadata" - the information about the information, as I explained the concept to the kids. Understand how the function of an object is influenced by its design and vice-versa. How something is designed influences how we can use it. Think about how things are designed all around you. Chairs are a certain height, pencils a certain length. Why? Give students 5 minutes and a plain piece of paper to design an alarm clock with only two buttons. I erred on the side of giving them very little information, I wanted to see what directions they went with the assignment rather than guiding them to consider all the functions an alarm clock can perform and figuring out how to map those functions to only two buttons. Activity Objective: Start to understand the idea of requirements for an object or function. Start to understand design constraints. Discussion: The kids came up with some creative ideas1 My own child spent time trying to explore a rube-goldberg type of sledgehammer/stone design to the single-use alarm clock (since it would be destroyed after one use.) Another came up with a solution that involved dials and toggles, in addition to buttons. Interesting expansion of the design because the spec didn't limit the use of dials or toggle switches. One incorporated a pie-in-the-face wakeup solution, focused much more on the end result versus the mechanics of getting the current time and wakeup time set.